Sam Walker, 16, of Nobleton, ON won his second major North American equitation title within one week after claiming the 2018 Running Fox CET Medal National Final on Nov, 8, 2018 at the Royal Horse Show in Toronto, ON. Just a few days before the CET Final, Walker made history as only the fourth Canadian to win the prestigious ASPCA Maclay National Championship, held Nov. 4 in Lexington, KY. Walker joins an elite list of Canadian winners, comprised of Canadian Show Jumping Team Members, Brian Walker (2001), Erynn Ballard (1998), and Laura Tidball-Balisky (1980). 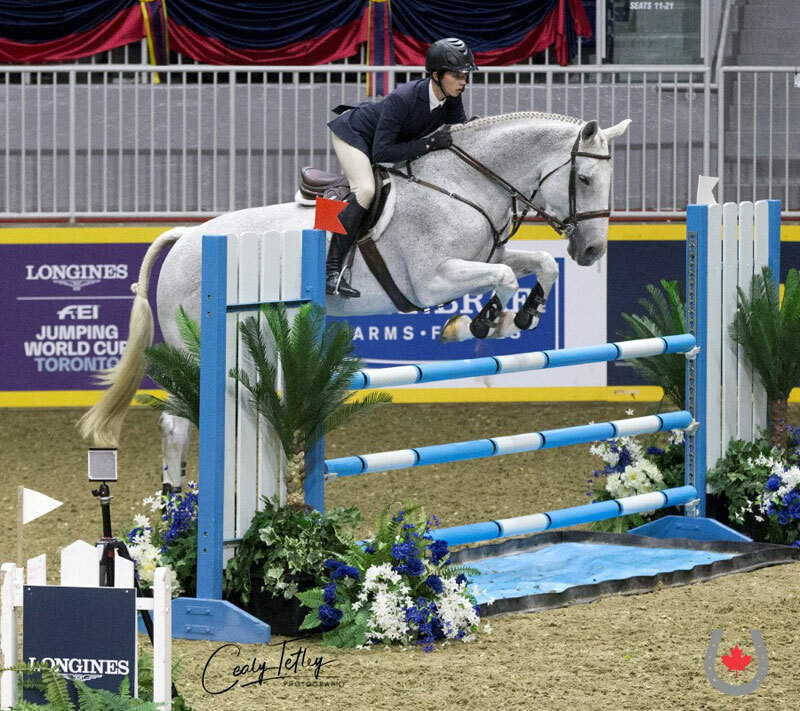 In order to take the CET Medal National Final title, Walker had to face off against 16 of the top equitation riders in Canada. Riders faced a long road to the Final, with the CET Medal series running throughout the season in the four regions of British Columbia, Prairie (AB, SK, MB), Ontario and Atlantic (QC, NB, NS, NF, PEI), followed by Regional Finals. Only the top four athletes from each Regional Final were invited forward to the National Final. Walker’s first challenge on the way to the title was the Flat & Gymnastic phase on Nov. 7. Riding Willem, a 15-year-old Dutch Warmblood gelding sired by Oklund and owned by Nicole Loochtan, he smoothly executed the extensive test – which encompassed flat elements, such as a change of lead, lengthening of stride at the trot and canter, and turn on the haunches, plus trot and canter poles, bounce and one-stride combinations, and even a line that had to be ridden in both directions, once in six strides, and then in seven. The judges awarded Walker with a score of 85 for his efforts, which proved to be the winning score for the day. Walker returned to the Coca-Cola Coliseum on Nov. 8 for the Jumping component of the Final, navigating a technical track that included a triple combination, liverpool, skinny vertical and multiple bending lines. After once again riding to the top score (89), Walker took another trip to the winner’s circle, and earned his berth into the top four test, with the advantage of performing last after earning the highest two-round total of 174 points. With just four jumps sandwiched between two flat elements (demonstrating two changes of lead at the canter, and a lengthening of stride at the trot) standing in his way of the title, Walker kept cool under pressure to be crowned the 2018 CET Medal National Champion. “I thought the courses were very fair for the riders in the class, and the rounds were very strong today,” said Walker. To help reach his goals, Walker will continue with his working student position at the legendary North Run (based in Warren, VT and Wellington, FL) with Clark and Brennan, who have a long history producing equitation champions. A well-rounded equestrian, Walker also competes successfully in hunter and jumper, and after a well-deserved week off post-Royal, will be heading straight back to work in preparation for competing with a large string of horses at the prestigious 12-week Winter Equestrian Festival in Wellington, FL this winter. Finishing just behind Walker as the 2018 Reserve Champion in the Running Fox CET Medal National Final was Beatrice Daviault, 18, of Saint-Damase, QC aboard her 13-year-old Belgian Warmblood mare, Lia. After receiving a score of 80 for fifth place in the Flat & Gymnastic phase and 81 for fourth in the Jumping phase, Daviault headed into the top four test in fourth place on a two-round total of 161. However, she moved up to second after a foot-perfect performance, where she demonstrated high quality flying changes and nailed every inside turn to the jumps. For the second year in a row, Mackenzey Nadeau, 19, of Carleton Place, ON earned third place aboard Ferraro K, a 16-year-old Danish Warmblood gelding sired by Olympic Ferro and owned by Brookstreet Stables. Rounding out the top four was Kyara Semrau from Foothills, AB aboard Cori Coletta, her 14-year-old Hanoverian mare by Contentro I. As the Running Fox CET Medal National Final winner, Walker was presented with the W. Douglas Hood Memorial Trophy, as well as a brand new Luc Childeric saddle from Debra Smith, co-owner of Running Fox. The title sponsor of the CET Medal series and National Final for over 20 years, Running Fox also provided coolers to the top eight finishers. For full results from the 2018 Running Fox CET Medal National Final, visit www.royalfair.org. *Note – the top four placings were determined by additional testing, not by the total score.